The Vendor ID and Device ID registers identify the device model, and are commonly called the PCI ID. The 16-bit vendor ID is allocated by the PCI-SIG. The 16-bit device ID is then assigned by the vendor. There is an ongoing project to collect all known Vendor and Device IDs. The Subsystem Vendor ID and the Subsystem Device ID further identify the device model. The Vendor ID is that of the chip manufacturer, and the Subsystem Vendor ID is that of the card manufacturer. 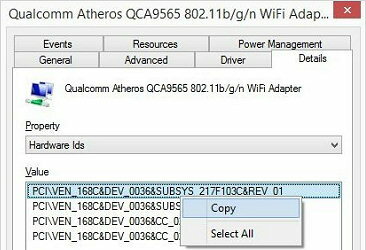 The Subsystem Device ID is assigned by the subsystem vendor, but is assigned from the same number space as the Device ID.